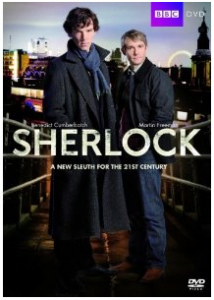 The first episode of British TV Serial; Sherlock, which is the modernized adaptation of the fictional detective Sherlock Holmes, his aide Dr. John Watson and the cases they were involved or associated with; is loosely based on (or taking reference from) the following short stories written by Sir Arthur Conan Doyle. The beginning gives you the idea of what is coming ahead. The same happens when you start watching this TV Series. A young fellow, later to be identified as Dr. John Watson, was struggling with his war memories. He visits psychiatrist and undergoes the counseling sessions. As the doctor suggest he lets get his thoughts a way out and pens them down! Well, in the form of a blog!! A really nice way to modernize the character and his habits of keeping and updating his diary. The title track is having fantastic music, which leaves nice impression. There happens several incidents where we see people from various age and gender takes a pill and later the news of their death released. Detective Inspector Lestrade, in charge of the cases have to answer the questions in the press conference, which he don’t know. The press conference scene is filmed really well. The dialogs, the expressions almost all fall in place. Rupert Graves is convincing through out the episode as DI Lestrade. There comes the introduction of Sherlock and his first meeting to Watson through a common friend (if we can say so). The scene explores the characteristics of both them really well. Sherlock is aggressive and observant and had a sharp memory. John is quite in tension as he have not much money to survive in the costly city like London and is of course having the bad war memories taking over him. Both Benedict and Martin does their best efforts to look convincing and they succeed. They seem to be different than the imagination of Arthur Conan Doyle, about the characters. But in their modernized avatar probably these actors are the right choice. The location of 221B Baker street – the home for – Holmes and Watson – is quite less impressive as it appear on the street. But for modern day crowded city, you can go for it, after a few thoughts. The interior is impressive and well thought, though. The dialogs are effective and the actors make them even better. 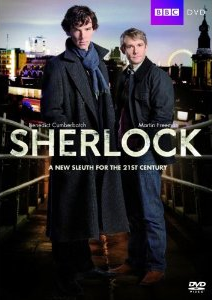 See Sherlock was enjoying the movement where he found challenging murder mystery await for him. 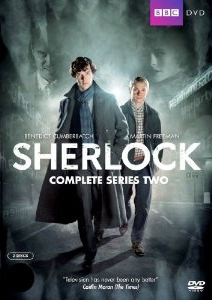 Also the way Sherlock says – The game is on – you will love it. There are places where the dialogs are simple and superb. But, the faster pronunciations in the key scenes where long dialogs are there, makes it impressive but a little less effective. The characters are developed really well. And a crime or detective fiction lover will enjoy the episode well. Their hunt for the culprit behind these suicide which are actually murders, is executed really well. The sets and locations are really convincing. The DVD quality is really well, which doubles your enjoyment while watching it. The amazing transformation of Dr. Watson (in terms of his leg injury) is a delight to watch. Also the climax is a delight to watch. Overall a nice episode with almost all positive attributes. The textual representation of the things happening inside the character’s mind or the mobile conversation, is impressive. We like it. Also, the way Mycroft’s character is introduced and weaved into the story is a delight to watch. Don’t be disappointed if you find the reason, the murderer was doing it for, a bit weird and unconvincing. Those who read original stories by Sir Doyle and seen earlier adaptation of the characters, may not found it convincing to see them in the way they are shown in the TV Serial, at least in the earlier segment (and especially the presentation of Watson and Holmes); but till the end of the episode, most of them will change their opinion. If you love detective fictions, and you like Sherlock Holmes and you have open mind to see him in new avatar. Don’t miss it. It have stunning performances to go for. It is interesting to know that this was the third episode to be produced, but due to some circumstances it is aired as the first episode! In original shooting, there was more details regarding Mycroft and Sherlock’s background and their relations. But, it then could have given away more than the desired information for both them, so a lot of footage was edited out.